Turkey’s take on the pizza comes in two distinct varieties. There’s the Arabesque lahmacun, a round, ultra thin-crusted snack topped with a shmear of finely ground meat and seasoning. 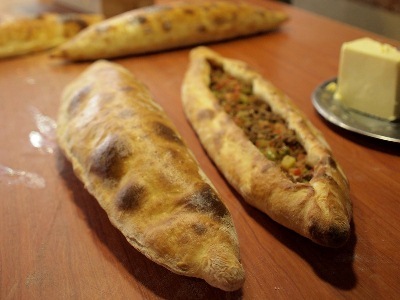 Then there’s pide, a more substantial canoe-shaped creation that’s a specialty of Turkey’s Black Sea region. In Istanbul, pide joints are almost as common as blaring car horns, but Şimşek Pide Salonu has won our loyalty for its consistently outstanding made-to-order pide and convenient location. Passing the time at one of Şimşek’s outdoor tables on this quiet, sunny side street just off of Taksim Square is a pleasure in itself. Add a few pide and you’ve got a party. This place is one of the best pide restaurants!